• The results of the first official Space: 1970 poll have been in for a few days, but I'm finally getting around to writing about it. The question was: What's your FAVORITE prime-time/syndicated Sci-Fi show originally airing between 1970 and 1980? A staggering two hundred and twenty-two Space: 1970 visitors voted. 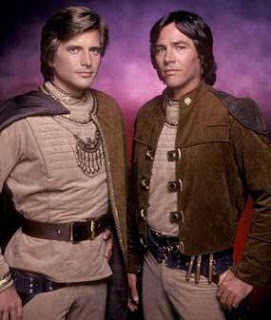 Coming in at #1 was the original Battlestar Galactica, with 66 votes. In second place was Space: 1999, garnering 40 votes. The big surprise for me was that third place was taken by Gerry Anderson's other 70's live-action opus, UFO, with 30 votes, just barely knocking Buck Rogers in the 25th Century into fourth, with 29. Fifth place was The Six Million Dollar Man, with 26 votes. So what does this mean? Well, that maybe I should write more about Battlestar Galactica and UFO, for starters. I'll post another poll soon. • Starting on December 20th, I'll be running a week's worth of posts dedicated to the post-Apocalyptic science fiction of the 1970s: The End of the World as We Knew It. It's the first "theme week" I've attempted here, and I'm curious as to how it will be received. There will be seven days of reviews and articles about flicks like The Omega Man, The Ultimate Warrior, etc., running through the holiday. • I've posted my review of The Bionic Woman Season One DVD set from Universal over on my DVD Late Show site. You'll find it HERE. In rewatching the show for the first time in decades, I was pleased to find that I still really enjoyed it, and that Lindsay Wagner - who was almost too good an actress for this type of show - was still as lovable and admirable as Jaime Sommers as I remembered. A rare kudos to Universal, too, for including the Six Million Dollar Man episodes that introduced the character. I still cannot afford the Time-Life complete Man set, and I would have been more than a little annoyed if those episodes had not been included in the first season Bionic Woman package. • Another recent review at my DVD Late Show site that might be of interest to Space: 1970 readers, is my coverage of the Space Precinct - Complete Series DVD set from Image Entertainment. Produced by Space: 1999 and UFO's Gerry Anderson, this 90's syndicated sci-fi cop show has a distinctly 1970's vibe. Review HERE. • Oh, and unless I've miscounted... this is my 200th post. I have to wonder where Lost In Space, Planet Of The Apes are in the number count? At one point a couple of years ago on my neglected blog I got a whole 5-6 votes on SCI-FI themes (which one was best). You might want to consider that for a future poll. And you can find just about any TV theme at http://www.televisiontunes.com/index.php . Cool! That's a lot to look forward to. As always, you're appreciated for everything that you do with the site. The Ultimate Warrior; I love that film! Congrats on post 200 Chris! Yep, congratulations on the 200th posting, that's quite a lot. The end of the world week sounds fun.